Huskyan is a bespoke new build small ship designed by the owners, Emily and Ben, and built for the 2015 season. Accommodation is across three decks and is modern, clean and spacious with a level of luxury uncommon on vessels of this size. 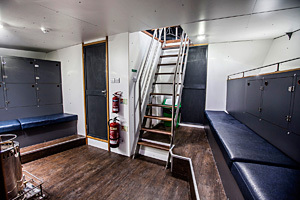 Each cabin has full sized, super cosy bunks with individual reading lights and charging sockets. 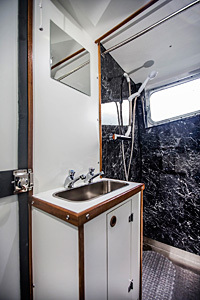 There is a bathroom on the accommodation deck with a large shower, toilet and sink and a further toilet and separate shower room on the main deck. 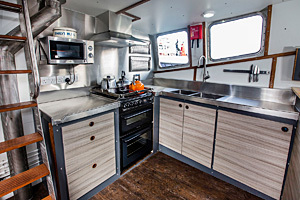 Below decks there is a large seating and storage lounge with a diesel stove to keep everything toasty warm. 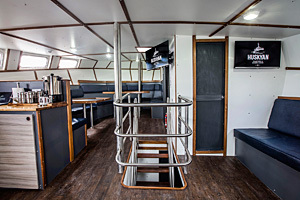 Above decks the open plan saloon and galley is the social hub of the boat. Huskyan has a lot of open deck space. 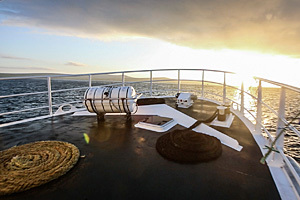 The 33m² aft deck has bench seating and the foredeck is the perfect place to relax and watch the world go by, and if the weather is a little inclement the panoramic views from the wheelhouse is the next best place to hang out. Huskyan is fully coded to carry up to 12 passengers, plus crew. 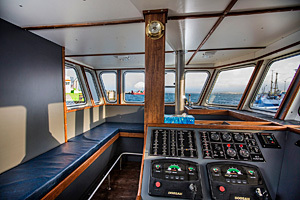 While we want everyone to have the best experience possible safety is always the main priority, and in this regards our vessel is equipped to the highest standard. We invest in our crew who are qualified to a higher standard than the MCA requires.